George Mianowski and Gerry Gorecki have the same birth date. February 2nd, 1951. Father Wotta was both terrifying and revered while teaching in school but he also went to Saint Mary's when he was young. He played on the basketball team as center and helped them win the state title. In those days, after every basket, there was a jump ball. He was so big he won almost every jump ball. Mianowski, Kramek, Niemczycki, Gorecki, Krause and Galazka all road motorcycles either during school days and some later in life. Dul, Malenfant, Gorecki and some underclassmen played in a band in 1969. Their biggest hit was a cover of the Aninals "We Gotta Get Out of This Place". Cyman was one of the first classmates to play varsity football. He played in the backfield. Megge played varsity Football, Basketball and Baseball. He only played Football for a short time because Rock did not want him to get injured and ruin his basketball career. He was one of the only freshman that started playing Varsity Basketball. He receiver many accolades during hist basktball career but his crowning achievement was surpassing Rock's record of most point per game, Tim scored the most points in a game against Saint Stanislaw. Tom Sudek won awards for the highest percentage of free throws in basketball, in his Junior and Senior years. Ken Ksiazkiewicz never played basketball until highscool. He did play 4-squares in his earlier years. His basketball idol was Lew Alcindor (Kareem Abul-Jabbar) and Ken wore the number 33. Antosiak and Krause enjoyed playing around "sacking" each other. They made a point to try and "sack" every classmate of 69. Galazka was the only guy in the history of Orchard Lake to be excused from going to church. Although he went to church a few times in his Freshman and Sophomore years and once for Graduation day, he spent most of his time in his room doing homework or studying. He later found out he was suffering from panic attacks. He did not find relief until the mid 90's. Although Father Rock was a nice guy, he was not a good coach. He was more like a baby-sitter. Zeebs was known for being slighty effeminate, fondling his breasts and often being refered to as "she". Sadly, he was killed when he was hit by a boat while swimming in Orchard Lake. Zientek put together a show imitating the motown sound. Dul stole the show with his blackface imitation. Later the part of the show was revived for gaudeamus night. Chris was known for being the artistic member of the class. Freddy got in trouble with Wotta for imitating Skrocker in a class skit. Wotta thought imitating faculty members was in bad taste. Mianowski and Galazka our the only 2 classmates that never married. George did have kids and grandchildren. Krause, Ksiazkiewicz and Galazka were almost kicked out in the senior year for taking the school van, and this was during retreat! This prompted a protest by the entire high school. Students were burning their student ID's as well as not going to a meeting in the assembly hall! As part of their punishment, they had to clean the senior rec hall. To accomplish this task Krause carried a buffer/scrubber on his back to the rec room. Someone also brought a fire extinguisher to the room. From outside, a sprinkler for watering the grass was brought in. The room was doused with water from the sprinkler and fluid for the fire extinguisher. Luckily, nobody walked in while the room was being cleaned. Afterward, a prefect inspected the job and said it was the best cleaning of the senior rec room he has ever seen! After graduation there were get-togethers at both both Sandy Peters and Tom Sudek's houses. Tom had a poker party. The class started with 80 students but we graduated with 29. Galazka was a decent golfer in his earlier years. He shot a 59 at Shenandoah Country Club, has one hole-in-one at Sylvan Glen Golf course and won the Tapco Invitational in 1987 which was held at Lost Lake Woods club. He also auditioned for the "Gong Show" and was supposed to appear on it but sadly the show was cancelled. He was on the "Tonight Show", starring Johnny Carson at the beginning with "Stump the Band" and won 2 tickets to a local restaurant in L.A.
Do you remeber who your "Big Brother" was? 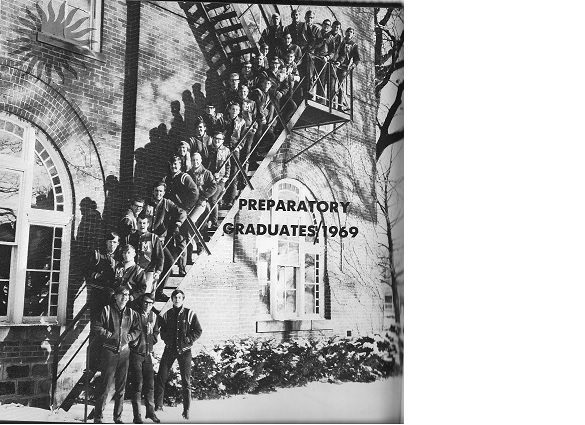 Check out the names of the graduating class of 1966.